Home Insights | News, Tech What is Power Line Communication technology? What is Power Line Communication technology? 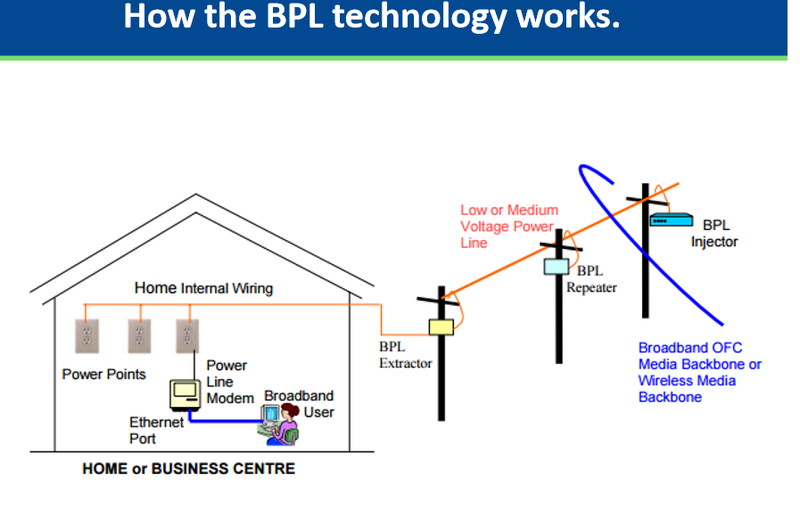 BPL stands for Broadband over Power Lines. It is an alternative means of providing high-speed Internet access, Voice over Internet Protocol (VoIP), and other broadband services to homes and businesses by using the existing medium voltage (MV) and low voltage (LV) power lines. It is also know as Internet over power line (IPL), Power Line Communication (PLC), or Power Line Telecommunication (PLT). Right now, we enjoy many technological advances on the internet, but this is not experienced for everyone. The BPL technology is blissful for those peoples who are living in rural areas where proper internet connection is still a dream. In rural areas, we can not get internet connection easily or to extend the internet connection is costly. 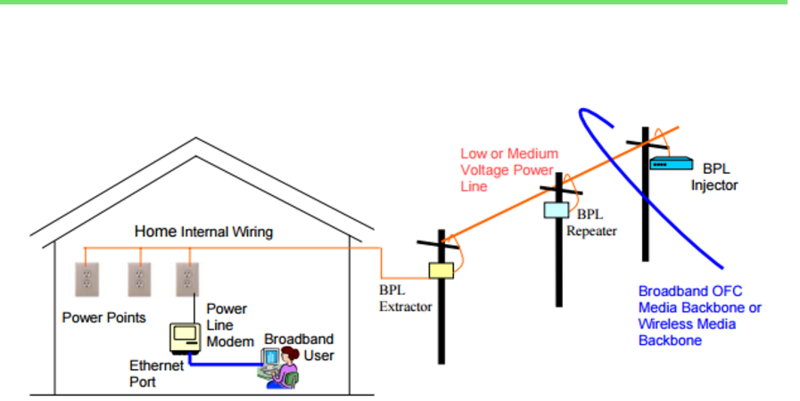 Broadband over power lines (BPL) is the answer as it allows data to be transmitted over utility power lines. Just imagine internet data is running on those power lines caring power as well. This is quite possible with the help of BPL technology. If we can provide internet through BPL technology, in every ruler area or right now the areas where the internet connection is not possible, then the people can get education easily, people can learn from anywhere, people will be connected with world more optimally. BPL allows access via our home wall socket. We have got a wall socket that provides power to our home electric appliances including TV, Fridge, AC, Lights, Fan etc. and the same socket can enable to use the internet as well from the same power line. BPL is a new technology with the huge potential in future. The cost of a LAN cable and building a necessary infrastructure to provide DSL or cable in ruler area is still quite high, but if broadband could be served through power lines. This means there would be no need to build a new infrastructure as the electricity system can be used for broadband internet connection. How the BPL technology works? Power lines must be in every area where we have to provide internet service. Internet Service Provider (ISP) setup it’s BPL system at power station. The BPL system inject the internet data in power line through multiplexer system and transmit with the power in power line. BPL technology need repeaters to amplify the data signal, so repeater are installed approximately every 1000 to 2500 ft. 5) The Internet data travel through power line from the sub-stations. The internet data distribute from the sub-station to the home are and office area with power. BPL extractors are located at each low voltage distribution transformer feeding a group of homes. The last mile is the final step that carries data into the subscriber’s home or office. In the various approaches to last-mile solutions for BPL, some companies carry the signal in with the electricity on the power line, while others put wireless links on the poles and send the data wirelessly into homes. Wide, spread and extensive infrastructure that is already available in remote areas in terms of electrical cables allow easy access to internet with relatively very little equipment investment, particularly in areas where limitations in terms of having a cable or DSL connections are experienced by service providers. Maintenance costs of BPL are also extremely low. Installation time is very less and rural penetration is relatively easy. BPL is a good solution for Home Networking than other available solutions as no other infrastructures is required. Standardisation – due to absence of international standards with physical characteristics of electricity. The amount of bandwidth that a BPL system can provide compared to cable and wireless is in question. Inherently very noisy due to high energy that they carry. Turning on or off every time of any electrical device introduces a click into the line which causes disruption. Compatibility and Interference problems with other users of the radio spectrum. Signal attenuation, boosting and repeater design. Coordination among Telecom & Power service providers. Security issues in adoption of Internet Services. Step down Transformers blocking high frequencies. Egypt: The Engineering Office for Integrated Projects (EOIP) has deployed PLC technology widely in Alexandria, Fayed, and Tanta. Based on a locally developed system, the company provides AMR for electricity utilities. Currently, the company has about 70,000 subscribers. South Africa: Goal Technology Solutions (GTS) trialled the technology and is offering service in the suburbs of Pretoria, and plans to extend it to other areas. The tests were done with Mitsubishi equipment using a DS2 chipset, and the company claims a maximum throughput of 90 Mbit/s although initially only “512 Kbits/s ADSL equivalent speeds” are available. Now it uses DefiDev’s equipment, and according to GTS’s website, it will expand available bandwidth up to 5-20 Mbit/s.